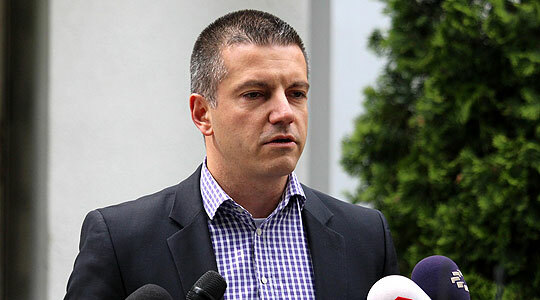 A statement from Minister Damjan Mancevski, who is primarily tasked with the workings of the public administration, caused additional outrage today after a relentless torrent of reports that close relatives of public officials were hired in the public sector. Those hired include relatives of former Prime Minister Vlado Buckovski, Speaker Talat Xhaferi, Ministers Kreshnik Bekteshi and Asaf Ademi, members of Parliament Mira Stojcevska and Goran Misovski and even some of the renegade former VMRO-DPMNE members who now support the Government like Emilija Aleksandrova. Asked about the daily scandals, Mancevski approved of the practice and defended it as a form of “payback”. For 10 years SDSM members were the most discriminated against and they were banned from taking public and private sector jobs, and that is a fact. Today it causes reactions when a supporter of our Government is employed in public institutions. Where are these people supposed to go? Should they leave the country?, an angry sounding Mancevski said. His colleague, Justice Minister Renata Deskoska defended even the appointment of a brother in law of Parliament Speaker Talat Xhaferi to the Anti-Corruption Commission, which should investigate precisely such examples of nepotism. The statements caused outraged comments even from erstwhile supporters of SDSM and the Government on the social media networks, annoyed from having to defend the latest indefensible position. This little man must the removed from his department immediately, outspoken SDSM supporter and leftist activist Mirjana Najcevska declared, speaking about Mancevski. “His statement openly promotes partisation of our public administration and destroys the very point of having a professional service under the merit system”.